Erik Oosterbaan from the Haarlem's Kayak Club sent a mail last week that he was planning a kayak trip on the Markermeer (this was a part of the Zuiderzee before the Afsluitdijk was built to close this huge sea arm off from the North Sea.) We don't like to miss any opportunity to kayak on big expanses of water so Theo and I decided to join Erik and our other clubmates. 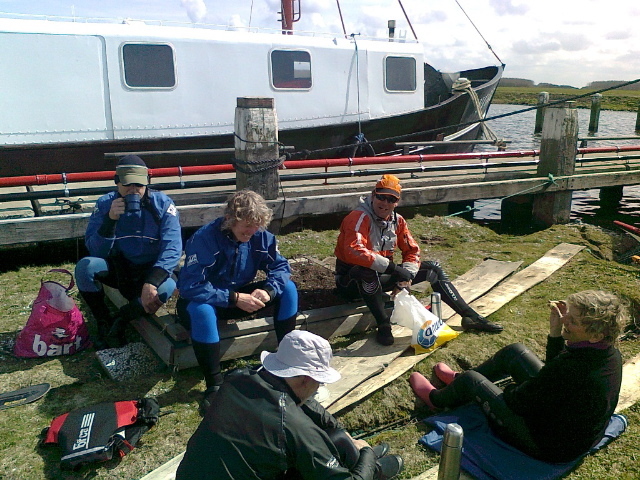 The day started out cold (neoprene gloves and "moffen"), a bit windy 3-4Bft but dry. 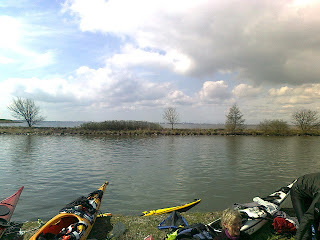 We experienced a bit of anxiety just before leaving when C. discovered that she had lost the small dry bag with "everything" in it - money, creditcards, bank card, keys, cell phone. It took a while before we gave up searching and as a result C. called her husband to ask him to pick her and her kayak up. After which she proceded to have all her cards blocked by the bank.Back to the startoff spot. Muider-beach. We headed for the emergency harbor (no panic!) of Almere and found a delightful place on floating gardens to enjoy our thermos coffee and sandwiches. 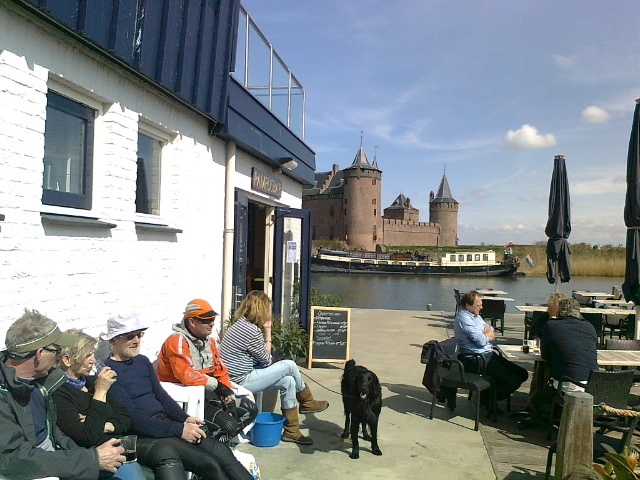 After lolling around out of the wind and in the sun for a while Erik insisted that we head for Pampus Island smack in the middle of the Markermeer and then change course toward Muiden in the hope of finding a cafe with cappucino e.d. 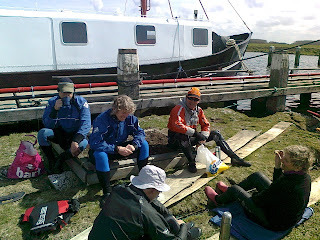 We paddled slowly into the shelter of the harbor, only to be greeted by another kayak group from Heerhugowaard - OSSA. We chatted and generally caught one other up on kayak news and other tidbits. We continued our search for the ultimate cappucino, drifting past the Queen's sailboat - the Green Dragon, and a chique "café came into view. KNRZV the Royal Dutch Rowing and Sailing Club - the royal family's own yachtclub. As you can see we installed ourselves on the terras and ordered what turned out to be one of the best cappucino's this side of Milan. 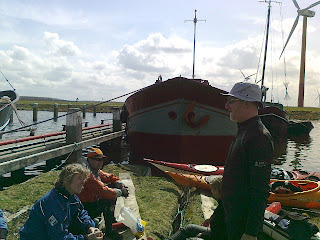 Reluctantly we climbed back into our boats, and with the wind in our backs finished the trip arriving back at Muider-beach around four in the afternoon. A great day and an unexpected trip.